1. Place the plug-in file in the specified location. 1. Using an account with administrator privileges, log in to the computer connected to the instrument. 2. Exit CorelDRAW if it is open. 3. 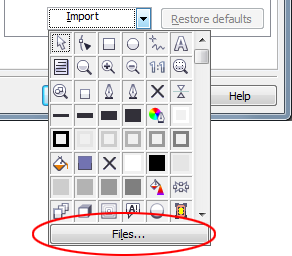 Open the "CutStudio_CorelDraw_PlugIn_Win_Vxxx" folder inside the unzipped "RSP-086_GS" folder. For X6 and X7: copy "CutStudioPlugIn.gms" and "CutStudioPlugIn.bmp" to the following folder. Note:Replace "##" with your CorelDRAW version number, such as "X6" or "X7." For X8: copy "CutStudioPlugIn.gms" and "CutStudioPlugIn.ico" to the following folder. Note: Open the [Folder Options (Windows 7) *1] or [File Explorer Options (Windows 8.1/10) *2], and select [Show hidden files, folders or drives] of [View]-[Hidden files and folders]. Then click [OK]. *1 Please select [Control Panel]-[Appearance and Personalization]-[Folder Options]. *2 Please select [Control Panel]-[Appearance and Personalization]-[File Explorer Options]. 2. Add the plug-in start button to the toolbar. 1. 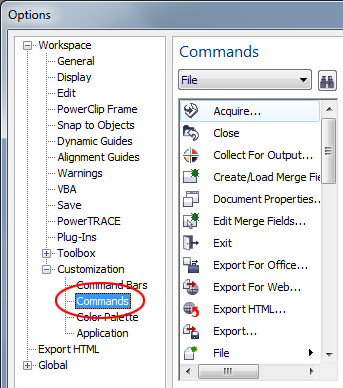 Start CorelDRAW and open a new document. 2. Click [Tools] > [Customize]. 3. Click [Customize] > [Command]. 4. Select [Macro] from the pull-down menu. The macro information is displayed. 5. 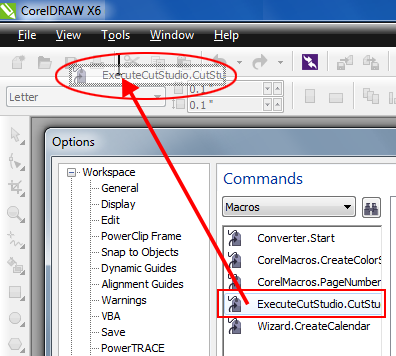 From the macro list, select "ExecuteCutStudio.CutStudio," and drag and drop it on the toolbar. If the macro is dragged and dropped on a location other than the existing buttons, a button for starting the plug-in is created. 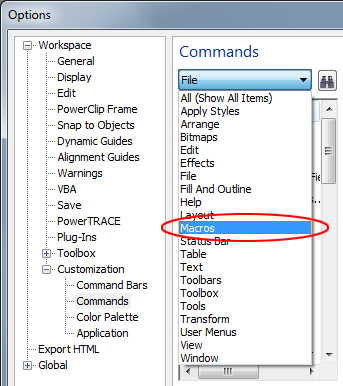 *Here, the macro is dropped to the right of the "Print" button on the standard toolbar. 6. Click [OK] to close the "Options" window. 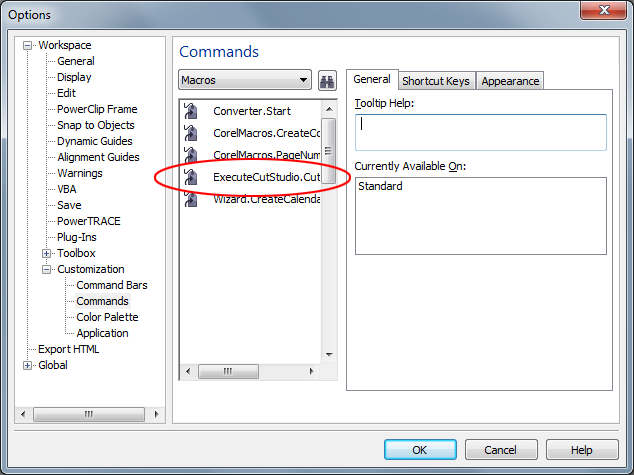 The start button will appear at the specified location once CorelDRAW is restarted. (Depending on your version, the button may appear without restarting. 3. Change the start button icon. *The plug-in can be installed without performing this operation. 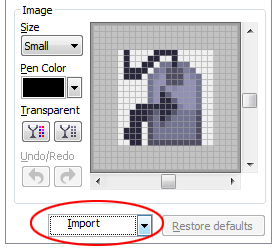 This operation is not necessary if you do not wish to change the icon. 1. Perform steps 1 through 4 of "2. Add the plug-in start button to the toolbar" above. 2. 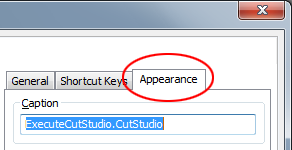 From the macro list, select "ExecuteCutStudio.CutStudio." 3. Click the Appearance tab. 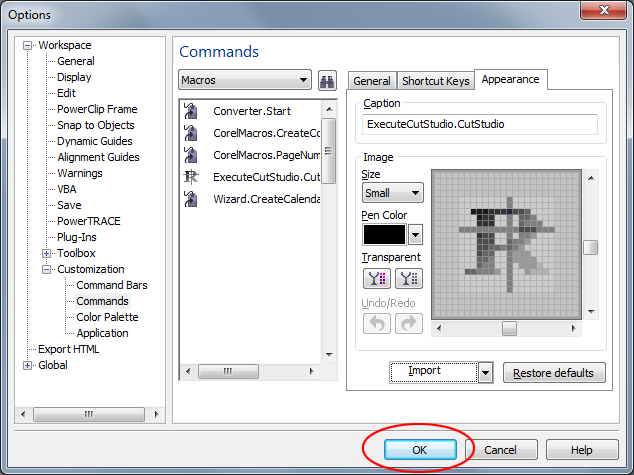 Depending on your version, "ExecuteCutStudio.CutStudio," selected in the previous step, may appear under [Caption]. 5. From the icon list, click [Files]. 6. Select the "CutStudioPlugIn.bmp" or "CutStudioPlugIn.ico" file placed in step 4 of "1. Place the plug-in file in the specified location." above, and click [Open]. 7. Click [OK] to close the "Options" window. The start button icon is changed to the specified icon. The CorelDRAW plug-in is now installed. Copyright(C) 2015-2017. Roland DG Corporation All Rights Reserved.